Little wonder, then, that AWF’s Congo landscape is located in the heart of the Basin, in one of the most undeveloped parts of the Democratic Republic of Congo (DRC). Unfortunately, the area’s 800,000 human residents—who live in poverty and have few income opportunities—have turned to unsustainable agricultural practices and illegal bushmeat hunting to survive, felling trees and diminishing wildlife populations in the process. For the past 10 years, AWF has worked to reverse these trends. It has made some meaningful conservation gains, thanks to two rounds of funding support from the U.S. Agency for International Development (USAID) and a philosophy of involving the community at all levels of land planning, species protection, and livelihood improvement. For example, AWF developed a land-use plan with residents that designated certain parts of the forest for agriculture or resource extraction and other parts as permanent forest. The resulting plan saves almost 200,000 hectares designated as permanent forest, across 33 communities. 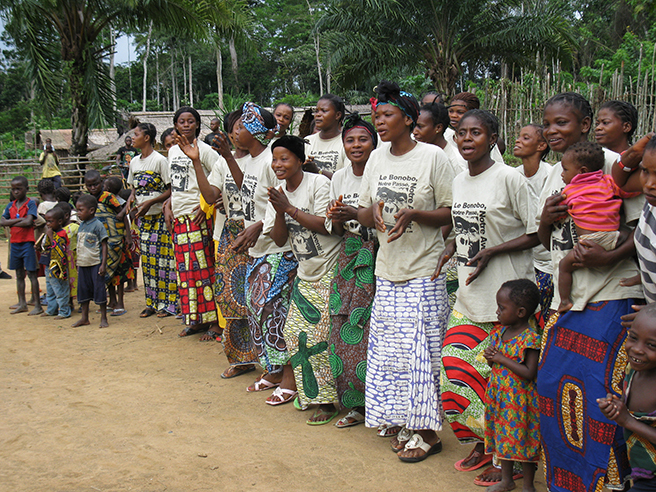 More importantly, says our Congo Landscape Director Charly Facheux, “we worked with the community to keep the forest protected.” AWF’s participative planning process has been recognized by the Congolese government as a model for other land planning efforts in DRC. In the area of species protection, AWF again put communities at the center of its efforts, establishing two community reserves—Lomako–Yokokala Faunal Reserve and Iyondji Community Bonobo Reserve—that provide officially protected areas for critical bonobo populations, create jobs, and bring in tourism income. Finally, we’ve addressed residents’ lack of sustainable livelihood opportunities. Through microgrants funded by the World Bank, for example, AWF has looped in local organizations to train more than 3,000 people in agroforestry, fishing, sanitation, sustainable agriculture, crop processing, market access, and more. These efforts have worked wonders. Household revenues in one town, Djolu, have increased by 15 percent since the start of our engagement here. Farmers have been able to get more from their land: Where once they abandoned their agricultural plots every year to raze a new part of the forest for farming, people are now working their fields for four years before moving to new land. And, a 2012 general census confirmed increases in the wildlife population across the landscape. AWF is continuing this momentum under a new round of funding from USAID. Goals include establishing a third community reserve and transforming our Lomako Conservation Science Centre into the area’s first Centre of Excellence dedicated to training in anti-poaching and ecological monitoring. AWF is separately addressing the lack of quality education in the region by building an AWF Conservation School in the community of Ilima. “If communities get income from tourism, sustainable agriculture, and climate change mitigation, and receive a good education, it will change their perceptions about conservation,” Facheux observes. “They won’t destroy the environment.” All of which bodes well for the Congo Basin’s ability to continue providing valuable ecological services to not only DRC but to all of Central Africa. AWF has been in the Congo landscape for 10 years—but Nakedi Maputla, our South African leopard researcher, is new to the landscape. See what Nakedi has to say about his new role as Congo landscape ecologist. Nakedi joined AWF in 2007, working in the Limpopo region, where he's from. Nakedi's initial work was focused on studying the great cats to shape conservation strategies to benefit communities he's known all his life. In 2014, Nakedi moved on from the Limpopo region, becoming AWF’s Congo landscape ecologist.